You don’t see it, or rarely hear about it anymore. 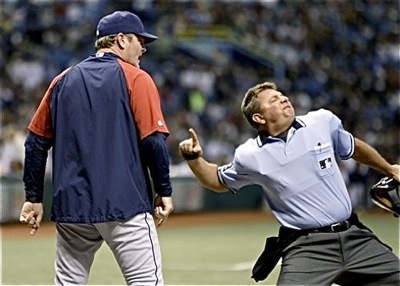 What use to be the highlight of almost any baseball game – the ejection – has gone the way of the ‘Goonybird’. I don’t know if you caught the dust-up in St. Louis on Sunday afternoon…when an argument broke out between Cardinals catcher Yadier Molina and Arizona Diamondbacks manager Torey Lovullo. It was a war of words – and not pleasant ones, either – that resulted in pushing and shoving with home plate umpire Tim Timmons (from Columbus) caught in the middle, trying to mediate. The benches emptied, Timmons got shoved forcibly from behind by Molina, who was trying to wring Lovullo’s neck. When it all settled down Lovullo was ejected from the game, for bad language (he directed a few of baseball’s magic words at Molina, not Timmons), and the game played on. No one from the Cardinals was tossed, which was a break with baseball tradition. Usually, when one team loses someone in an incident like that, the other one does, as well. You don’t see many ejections anymore – in any sport. They’re frowned upon by league administration for the sake of image; and if players or coaches get tossed often enough they’re suspended to the point of it being ridiculous…the penalty being worse than the crime. And in amateur sports – high school, college, and even Little League – it’s become thought of as a black eye on the community if someone is thrown out. High school baseball has guidelines that say if a coach or player is ejected they can be levied a two-game suspension; and coaches must take an online course for $100 (I think) for anger management, I suppose. The OHSAA and other administrative bodies have taken a dim view on it because they believe it to be an example of poor sportsmanship. Ironically, years ago it was called, or known as, little more than ‘gamesmanship’. It seemed like my high school baseball coach, Jim Hardman, got tossed at least once a year by an umpire named Doc Staley, and no one in Piqua schools, or the community who witnessed those games, gave it a thought. But now…..it’s different. It was once an added feature to a major league game. You might see the manager get tossed. Former umpire Steve Partington, who worked for decades at nearly every level of the game, agrees. “Umpires, especially, take more abuse than they should because that’s changed along with the times,” says Partington. “It used to be that if you were getting flack from the dugout you could look over there and tell someone to shut up with a few expletives and that was the end of it. Now if you use that language you’ll probably be banned from working. But does an ejection necessarily mean that someone has exhibited poor sportsmanship? 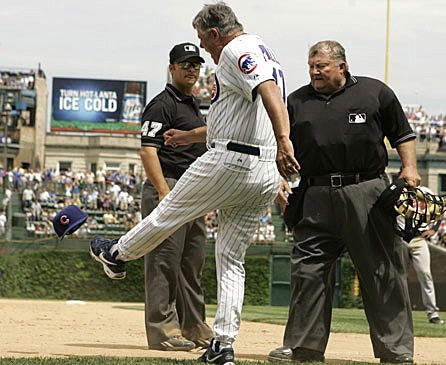 When former Reds manager Lou Piniella (above) had a tantrum people smiled…and no one was damaged psychologically. Partington is right about the generational change in perception of bad behavior and sportsmanship. When I was young and my parents would take me to a Reds game my dad actually counted it a bonus if you got to see someone like Leo Durocher (Cubs manager) or Alvin Dark (San Francisco Giants) get tossed. Now, that part of baseball is gone with video replay. There is no recourse for argument, or even discussion, once the play is reviewed, so that bit of theater has been removed from baseball, probably forever. What happened between Molina and Lovullo Sunday stands as the extreme exception. And someone sitting close enough to the field to hear what was said probably went home feeling offended that they had to witness such a thing on the Sabbath. But the same people probably watch shows like Curb Your Enthusiasm on HBO and think it’s good clean fun. And, they probably don’t mind if Larry David drops a few ‘F’ bombs. But maybe they should; and maybe they should do some paperwork of their own and send it to the television networks. It’s far worse than anything I ever personally observed in baseball. God forbid…the lost art of the ‘ejection’.